If you’ve perused the news lately, you may have seen that the U.S. equities market is in a correction. While this shakeout in equities has made headlines and paused retail investors, Fixed Income has had its own shake up. On February 2, the 10-Year U.S. Treasury yield reached 2.85%, breaking a consistent trend line we’ve seen since 1990. This could be a sign of a potential bear market approaching for longer-term fixed income. Additionally, the U.S. Treasury 30-year Yield Index TYX reached 3.125% on February 5—its highest level since March 2017—before reversing and hitting 3.050% the following day. And we also saw the U.S. Treasury 5-year Yield Index FVX reach its highest level in more than five years before taking a dip. Often, we see a consistent trend before and after financial crises. The U.S. savings rates increase after a crisis but eventually return to its pre-crisis level when the market levels out and stays strong for some time. 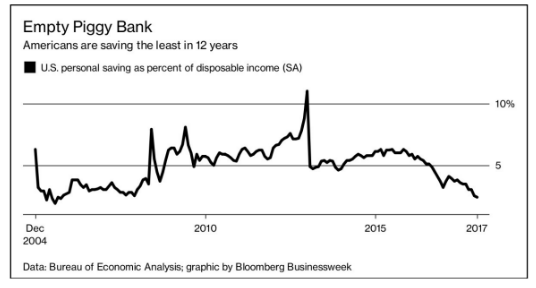 While low unemployment and tight labor markets are good for the economy, they tend to have a negative impact on individuals’ savings accounts. People spend and invest, leaving their savings accounts slim. However, if a full-blown recession hits, many people wouldn’t have the savings they need to prevent big changes in their spending patterns. 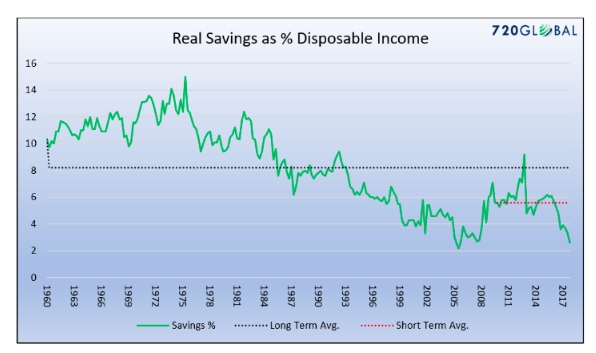 Most recently, the U.S. savings rate hit one of the lowest levels recorded in the last 70 years—2.6%, meaning consumers are spending 97.4% of disposable income. (1) As seen in the chart below, the current savings rate is not even half of what it was around the 2008 recession, and significantly lower than previous periods. With a lack of savings comes credit card usage. Along with the latest trends in savings, we’ve seen an increase in credit card debt, which is often a sign that consumers may be struggling to keep up with the Joneses. 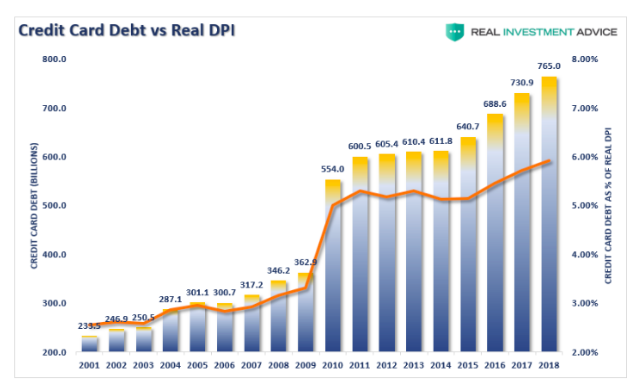 Credit card debt has increased at nearly 6% each year these past four quarters, which is nearly double the pace of disposable income. This 6% growth rate is also three times as fast as the years immediately following the 2008 recession. Whether it’s in real estate or the stock market, I often ask my clients if they are prepared to take advantage of a market downturn and buy assets that are “on sale.” Don’t make the number one mistake of investing and buy high while selling low. With enough savings, you won’t have the opportunity to buy low and work towards building your wealth. 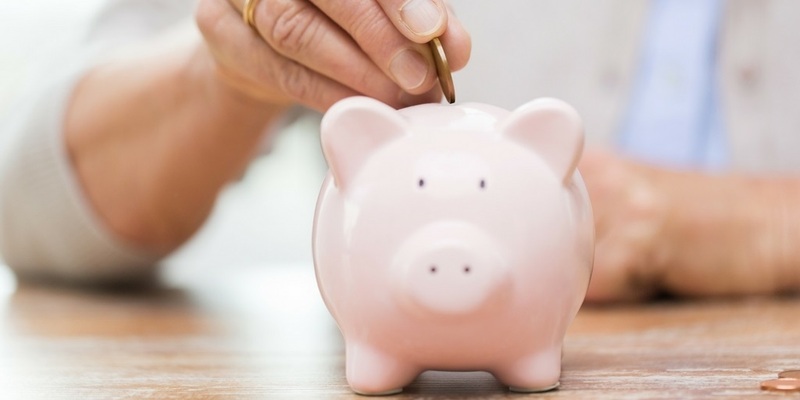 Building up a savings is important for a number of reasons beyond investing opportunities. One big reason is to be able to pay for unexpected expenses rather than take out a loan or charge them on a high-interest credit card. If you find your savings account is looking slim, there’s never a bad time to start saving. You can get started today in a few simple steps. Create a budget. A budget can help you identify areas of spending where you can cut back. Reviewing your past expenses can help you see if you’re overspending anywhere and how you can put more of that money away into your savings. Set a savings goal. Rather than save at random, setting a specific goal can help you stay on track. You can start small—say $50 per week—and increase that amount each month until you’ve reached your goal. Keep your savings in a separate account. Don’t lump your savings with your checking and any accounts from which you regularly withdraw. Putting the money away in a separate account will make it less tempting to take from when you’re feeling spendy. Do you feel prepared for the next market downturn? When’s the last time you reviewed your portfolio or financial strategies? Whatever your questions, we can help. We welcome the opportunity to learn about your unique situation and discuss how we may be able to help you. To learn more, contact us today at (626) 529-8347 or email me at [email protected].